This is the island castle home of our president, Lord St. Levan, whose family owned the castle from the date of the restoration of the monarchy in 1660 until 1954. The property was then given to the National Trust by the 3rd Lord St. Levan, together with a large endowment. The family continues to lease accommodation within the castle from the National Trust. The choir has a long and distinguished history of success in music competitions throughout the country, including winning the Male Voice Choir Advance Class and Championship Cup at the 2009 St Austell Music Festival. The choir enjoys travelling, and in recent years has performed in the south west of Ireland, in Grass Valley, California and in Brittany, where they sang with local Breton choirs. 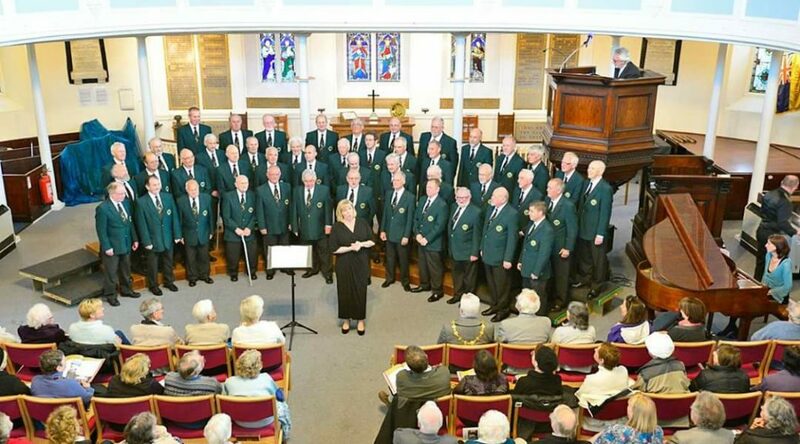 Closer to home, they have visited West and South Wales, Somerset, Nottinghamshire and Derbyshire as well as singing in many locations across the length and breadth of Cornwall. Marazion Apollo has made a number of records and CD’s over the years, and are on sale at all our performances. The full length CD ‘In the Spirit’ contains 16 tracks of the choir, with Cornish soloist Laura Nicholls singing a number of tracks with the choir, as well as on her own. The choir is currently in the midst of recording our first cd under the leadership of Kate Wood-Cattran. In September 2010, the choir recorded a 3 track CD to raise money for Help for Heroes. It contains the well known songs, For The Fallen, Bring Him Home and Mansions of the Lord. All performers and production staff gave their time free of charge, and all profits from the sale of the CD are sent directly to Help for Heroes. In early 2014, Newlyn Male Voice Choir was sadly obliged to close due to dwindling numbers. Many members chose to join Marazion Apollo and were given a very warm welcome. They are a great asset to the choir and we hope they enjoy the rest of their singing careers with us. The Choir’s Musical Director is Kate Wood-Cattran. Kate joined the choir in April 2013 and this is her first appointment as MD of a male voice choir. She is a talented singer in her own right, appearing in many choral and operatic productions throughout the South West. She is also a music tutor, working with some of the finest singers in the Duchy. The Accompanist and Deputy Musical Director is Stella Pendrous, who joined the choir in 2014 after serving as the accompanist for Newlyn MVC. She is an accomplished solo pianist, as well as being in demand by vocalists across the county.